No one speaks fluently all the time – just listen to radio personalities and you’ll hear how many hesitations occur in normal speech! But some people have more or different dysfluencies than others. The exact cause of stuttering is unknown. 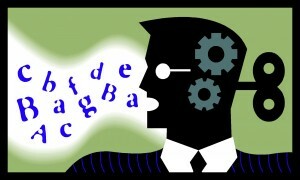 Speech production is an extremely complex physical-neurological-psychological process. A very slight physical variation in the activity of the brain can interfere with the rapid coordinated movements of the vocal cords, tongue and lips, creating what we call stuttering. Stress can certainly make stuttering worse. There can be word repetitions (e.g., my my my), sound repetitions (e.g., m-m-m-my), prolongations (e.g., mmmy), and blocks (i.e., air becomes ‘stuck’ before being released – “m………y”). Speech-language pathologists assess an individual’s speech fluency through a variety of speech tasks (e.g., speaking in conversation, reading aloud, describing pictures, reciting the days of the week, etc). Through these activities they can observe the types of dysfluencies an individual experiences and can introduce a variety of fluency-enhancing strategies for fluent speech production. Each strategy is carefully explained, then practiced in structured therapy activities and later transferred to functional communication tasks. Take a full BREATH before speaking. Reduce your speech rate and talk SLOWLY. REHEARSE for important meetings and presentations.